Good Morning, Monday! Greetings from Sils-Maria, Switzerland! What better way to ponder the upcoming week, and a new month, than to put on hiking shoes and wander the Swiss trails? Here in Sils, a small village west of St. Moritz in the Engadine Valley, I am far from the noise of my hometown, far from politics, far from all that concerns me. Instead, I focus on one footfall at a time, practicing mindfulness in order not to fall off a mountain! Yesterday we wandered to the Fex Valley, a place we wanted to visit in January but couldn’t because there was too much ice on the trail. We admired wildflowers, clear streams, and mountains covered with emerald green instead of snow. Part of the magic of Switzerland is finding a charming restaurant in the middle of nowhere, and we enjoyed some rosti with tomatoes and cheese for a hearty lunch. 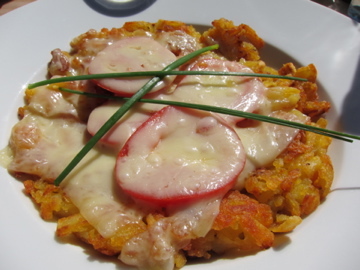 Rosti is basically a meal-sized portion of hash browns (only better), and these were done to crispy perfection. Rosti makes for a great hiking meal, and I find myself craving it when we come here. After lunch we took a spontaneous trip up the side of a mountain so we could see the lake there. The sign suggested it would take two hours, and those signs are normally reliable. This time, though, it was about an hour short. We live, after all, at sea level, and we huffed and puffed our way up, stopping frequently to catch our breath. Once a herd of cows stopped us as they blocked our path, and one curious cow decided it wanted one of my hiking poles. We decided to find another way around them, circling through pasture and back to the path. 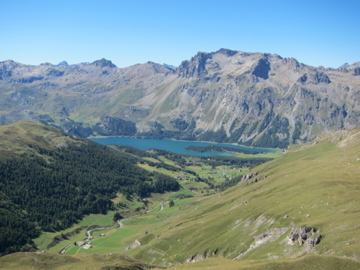 We finally made it to our summit, where we saw a glorious view of the valley below, including the opalescent Lake Sils. From a distance we could no longer see the windsurfers out playing on a Sunday afternoon, but the larger view of mountains, glaciers, and meadows was worth the effort. My feet didn’t agree as we finally landed back in Sils at 6:30 p.m. after 2,800 feet up (and back down), but we loved having a story to tell. The lake is where we began our day. While in Sils, I feel myself in transition. Summer continues to rage back home in Houston, with highs reaching 109 degrees, but fall approaches. My novel is back with the editor for one more look before I put it out into the world. I prepare to send her another manuscript. I have begun others, but am not sure which story will call to me next. I am stepping back from some of my normal day-to-day routine to fill the inner well and find the Next Project. When we are in transition, and our dreams are in process but not yet manifest, taking time to be in silence and stillness can ease the drama of our daily lives, freeing us to create. As we ease into September, A Woman’s Nest will focus on how to do that. Many people tell me, for example, that they can’t meditate because “I can’t get my mind quiet.” I was thinking of that yesterday as we hiked in the mountains in one of the quietest places on earth. Even here, there is not absolute stillness. A breeze blows through the wildflowers. Water rushes over rocks down the mountainside. Birds call. Cow bells ring. Nature is never completely silent, and seldom will we be, either. But I would like to demystify meditation this month so that we stop worrying about stilling the mind and start accepting a river of peace that flows gently beneath the other noise that exists, allowing that noise to be there without judgment. Flowers Abound! Here are some to brighten your day. Another reason to find stillness is that when we start to manifest our dreams, we will bump up against fear, doubt, and frustration. As we keep coming back to center, we can learn to deal with inevitable discouragement. Our Wednesday features will focus on the challenges and opportunities that come as we open ourselves up to deeper self-expression. Our Tuesday reviews will focus on DVDs and books that can inspire us when we need to be lifted up. Have a great week! Thanks for visiting my blog, and come back tomorrow for the Discovery Tuesday! I love Thursdays, because I get to share other websites that both inform and entertain, providing you, the reader, with much more content than I could provide alone. In recent weeks as I have revamped this blog, I have found genuine pleasure in finding resources to share. We Boomer women are forming a remarkable presence on the World Wide Web, with plenty of thoughtful insights and fine writing. Today’s website is a real goodie! It’s the National Association of Baby Boomer Women. Here you’ll find a gathering place for articles of interest on women’s health, finances, humor, and more. the NABBW provides a staggering amount of information in an accessible format. If you want to join the NABBW, you will pay $75, though there are ways to get discounts on that fee. However, I am currently at the “free” membership level, which allows me access to a wide range of information. So, you’ll have an opportunity to check it out before forking over any money. Enjoy! I’ll be back Monday with more news and musings. At this point in August, the nests are starting to empty as college students go off to school. Vacations are winding down. So now what? With the house quieter, our thoughts can turn to our own lives. Who are we outside of the role of parent? We may not even know the answer to that question, or even know where to begin to find the answer. Yet now is our time to discover ourselves. This last year we returned to Rome, where ancient ruins coexist with roads, museums, and restaurants, the chaos of modern life. Turn a corner in Rome, and history rises up, sometimes unexpectedly, offering some treasure of an ancient and magnificent civilization. This time, having already seen many major sites on a previous trip, we went to the Domus Romane. Beneath the Palazzo Valentini, built in the 16th century and now home to governmental offices are the ruins of a home from the 2nd or 3rd century. We toured the museum on glass walkways that allowed us to peer into the past and into the former glory of the property, complete with mosaics in marvelous condition. Our lives may look much like that. On the surface we have our jobs, our homes, our “stuff,” and it may all look pretty good. We just sometimes forget that we have deeper levels just waiting for excavation. Once we dig a little deeper, we may get very excited about what we find–and at midlife, we may feel the need, the urgency, to do so. As someone who always planned to write a book “some day,” I struggled with how to get started. I had no ideas. I just knew I wanted to write. In the summer of 1997 I discovered Julia Cameron’s The Artist’s Way and started to work the program she provides. Within three weeks I wrote my first short story, and I haven’t looked back. I have published one book, edited two others, and am completing two novels that I plan to e-publish. I have other novels in various stages of development, just waiting for me to get to them. Not only did I connect with my writing life, but I also learned to quilt, played with photos, videos, and audio recordings, went back to school, took yoga teacher training, and started a garden, just to name a few. My husband and I travel as much as possible in our hunger to see the world. In short, I unearthed a wild cacophony of creativity that continues to insist on bursting forth. Even at 52, I am still making new discoveries. 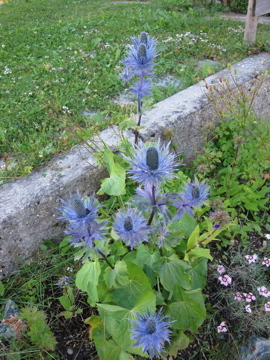 I recently, for example, became curious about medicinal herbs and am starting to learn more about them. What dreams live inside of you that have gone unlived? Yes, parenting is noble, as is grandparenting. We all have a desire to make a difference in our families, and perhaps even the world, by giving. But what makes you tick? What matters to you as a person? What longings live inside that demand expressing? Further, once you’ve identified those longings, what do you do? If you have had a secret desire to change careers, what would it take to do so? Even taking a class or two at night or online can help you move toward developing new skills. If your nest still isn’t empty, you can study alongside your children still at home, and they can watch you do your work, providing an invaluable example for them to follow. I grew up with parents who were readers, and as I observed them in the evenings, noses burrowed into books, I gained value from their example. Whatever it is, you’re not too old. You may not make the Olympic team, but what about the Senior Olympics? Or, you may want to try your hand at a half marathon or lengthy charity bike rides. You may not build a major corporation, but do you have a small business idea worth exploring? Is it time to take that drawing class? Maybe you have dreams but need to clear some financial dead wood first. What resources can you find, such as books by Suze Orman or Jerrold Mundis, to help you? What about Debtors’ Anonymous? Having lived through and overcome some financial nightmares, I know that financial problems can be solved, and sometimes more quickly than we might think. This week, make a commitment to do something for yourself and your dream. It can be a baby step. Some people who start writing, start with a paragraph a day, and that can be enough to create a small spark of satisfaction and fulfillment that opens up a new world for you. What is your dream? How can you get there? Unsure? Let me hear from you. I hope everyone had a great weekend! Since I am neck-deep revising two novels, I have kept busy. I’m trying to get the latest versions done before we embark on our next trip in a few weeks. These revisions include increasing detail, so I’ve been “shopping” for my characters, buying them clothes and cars that show their lifestyle. My character Julia absolutely needed a little Mercedes Cabriolet convertible–red, of course! In my real life, I’m not fond of shopping (unless I’m with my sisters! ), but I confess that I am having fun feeling like I’m revisiting childhood dress-up play. As we enter into mid-August, for many of you the nests are emptying out. It’s a good time to think about playing dress-up with our own lives, whether that means trying on new clothes or trying on new activities to discover or rediscover our interests and passions. Last year I learned that I loved gardening, even though I never tried it until age 51. Who knows what surprises are in store, if we just open ourselves to this new phase? What can we learn about ourselves and what holds meaning for us? While we’re playing dress-up with our new lives, we may feel like young adolescents in other ways, too, as hormones create interesting situations and force mental, physical, emotional, and spiritual transitions. This week, for our Book Discovery Tuesday, I am going to write about Susun Weed. While she has a new book that I haven’t yet read, I have found one of her older ones, The New Menopausal Years, to provide supportive help and relief for menopausal symptoms. It’s tough to be excited about the midlife years when we’re battling exhaustion, depression, and hot flashes! With warm, encouraging words, Susun initiates us into menopause, acknowledging both the challenges and the invitation to shed old roles that no longer serve us. On Wednesday, we’ll talk more about uncovering our identities now that our roles as mothers diminish. We’ll look at how to find and rekindle old dreams, as well as how to manifest them. We’ll look at ways to cut away those activities that drain us or otherwise take us away from those dreams so that we can take time each day to take care of what truly matters to us. I’m excited that some of you are starting to contact me and share your experiences! Please keep the feedback coming. Also, if you have a favorite blog to recommend for our Thursday blog feature, please let me know. Have a great week! My husband insists that as children near college age, something happens hormonally with both the kids and the parents. That “something” causes us to suffer less—and even celebrate—when they finally leave home. The closer the time came for his kids to head off to college, the giddier he became. We were ready and determined to create a Happy Empty Nest. Having come into a home with twins in their senior year in high school, I was, admittedly, reluctant to let them go. I had always wanted kids, and I liked having them around. By the time they left, I had just gotten comfortable with my new role as stepmother after 45+ years of childless freedom. As my hubby threatened to break out the beer, I had a good cry. Of course, back in the day when our generation first left home, we didn’t have cell phones, e-mails, or instant messenger programs. We had landlines (how quaint) and sent letters back and forth. Neither my husband nor I anticipated how little we would sense their absence. The empty nest has changed. Some days, they might as well be in the room, we talk with them so much! Moms of the world who hate sending their children away from home may take comfort in this new accessibility. I have to ask, though, is this accessibility good? If we’re not always available and let a phone call go to voice mail, we have found that the children find other ways to solve their own problems. Isn’t that part of what we want? Plus, I think that an essential part of building a happy empty nest means finding out who we are when we are not parents. Husbands and wives need to get reacquainted with each other, and most of us have set aside our own dreams, at least for a time, to handle the care and feeding of the young. What were those dreams, anyway? What a great time to explore—as long as we hang up the phone long enough to do so! Of course, while we are getting comfortable with our new identities, the children tend to come home from time to time. At first, it’s the long summer and winter breaks, and a shorter spring break. These are awkward times; they have lived as adults, and suddenly, on visits home, they are subject to rules and demands that they don’t want. Some want to be treated like young children again, whiling their vacation away in front of the television while someone else prepares their meals. The Happy Female Empty Nester, in order to stay happy, will need to insist on more participation. After all, we are starting to live our dreams, so we don’t feel like waiting on young adults hand and foot anymore. Then someone gets a summer job that requires time away from home. Maybe one of the children wants to go off with friends on spring break. They graduate from college and, hopefully, get jobs. This is where my husband and I are in the process. Both kids have graduated from college. One is working, while the other is taking an additional year of specialized education. It’s exciting to watch them take on their own lives, as well as to have more time to focus on ours. We’re turning the upstairs into guestrooms for families that may expand at some point. Oh, wait, that means possible grandchildren that Grandma and Grandpa will babysit. Hmm, maybe the empty nest isn’t empty for long after all. We have returned from a lovely vacation in Washington state, where we visited and hiked on Mt. Rainier, saw friends and family in Seattle, and then had a few quiet days on San Juan Island. While there, I ran across this lovely print by Terrea L. Bennett. Actually, I bought four pieces of her work because it really spoke to me, but this one, called Seeds of Wisdom, captures the spirit of what I want for this blog. 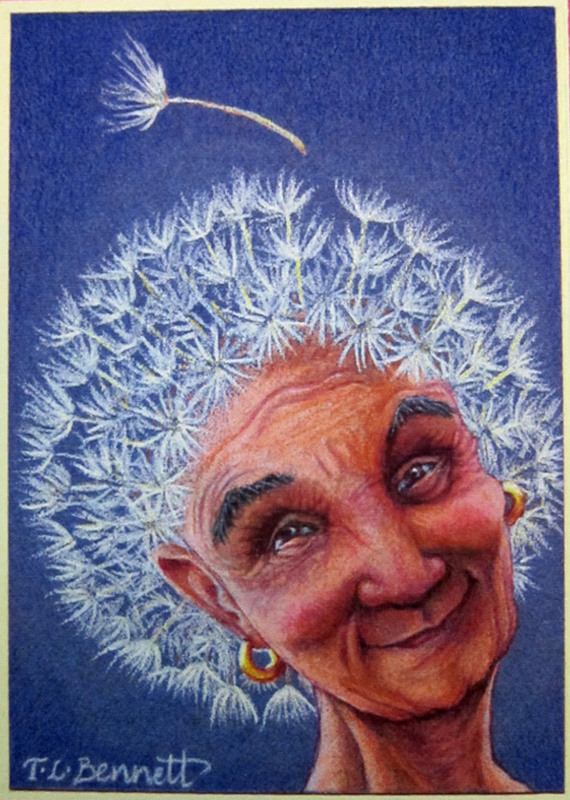 Here is a woman who ages with joy and whimsy intact, and who shares her wisdom with generosity, the way a dandelion scatters its seeds. The dandelion, much like women at midlife and beyond, is often unappreciated but loaded with extraordinary gifts, shared freely if we only take the time to receive them. Now that we’re back, I’m eager to embrace the week on this blog. I’ll be reviewing Ana Forrest’s Fierce Medicine, and we’ll delve more deeply into the topic of the empty nest. And, since my editor was busy while I was gone, I’ll be revising Change of Plans in hopes it will be ready as an e-book novel for the holiday gift-buying season! 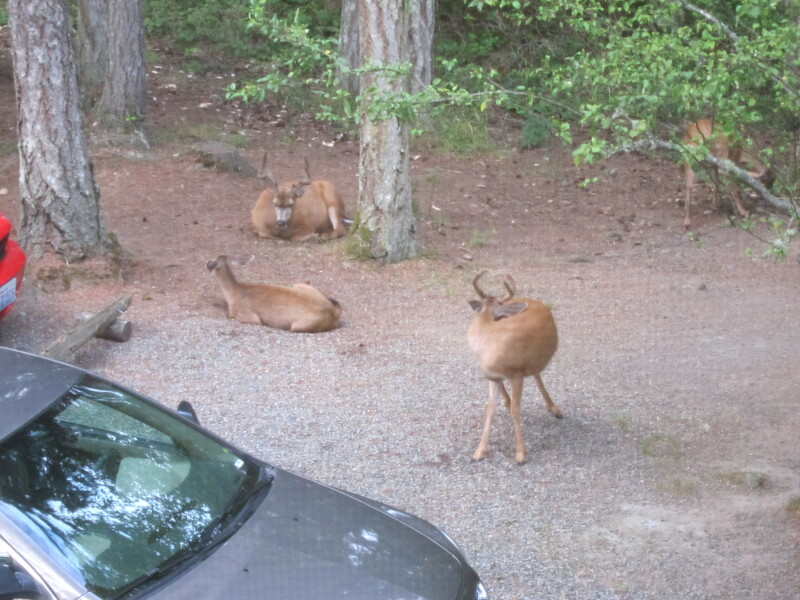 Just for fun, here’s a view outside of our bed & breakfast on San Juan Island. Have a great week!